GPS maps tell you where you are right now, and the voice of Siri on your phone may direct you to destinations. But where are you, really? I prefer old-fashioned printed maps like the DeLorme Atlas & Gazetteer that provide the big picture – the context of where you are and where you’re going, and the county highways and back roads that are the real somewhere for many in our country. The weekend of October 5-8, 2018, I employed my Wisconsin Atlas & Gazetteer and the Fermentation Fest’s map for the Farm Art/DTour to visit temporary outdoor artworks and a few improvised ones; poetry displayed like the old Burma-Shave signs along the road; art and food marketplaces at rural churches and in small town squares; and on-the-farm stores selling cheeses, meats, eggs and produce. These locations are stitched together by county back roads, some barely wider than a driveway, through the undulating landscape of the unglaciated Driftless Area around Reedsburg. In 1998, Jay coined the term “cultureshed” which is important to understanding their worldview and work as artists and farmers. He poetically defines it as: 1. A geographic region irrigated by streams of local talent and fed by deep pools of human and natural history; 2. An area nourished by what is cultivated locally; and 3. The efforts of writers, performers, visual artists, scholars, farmers and chefs who contribute to a vital and diverse local culture. Jay says a cultureshed is similar to the agricultural concept of ‘terroir’ in which the products grown in an area reflect its unique geography, geology and microclimate. In 2011, working with partners in Sauk County, Jay and Donna produced the first Fermentation Fest – A Live Culture Convergence and thousands were drawn to Reedsburg (pop. 10,000) and the surrounding area for classes and hands-on sessions about bread-making, brewing beer and how to make krauts, pickles, kimchi, condiments, cider, kefir, kombucha – anything involving fermentation. The growing event quickly captured the imagination of funders including the National Endowment for the Arts, ArtPlace America, the Andy Warhol Foundation for Visual Arts, the Educational Foundation of America and the Wisconsin Arts Board. The Farm Art/DTour, a 50-mile self-guided drive, is a signature feature of Fermentation Fest. At first an annual occurrence, now because of funding challenges and its complex logistics, the tour happens bi-annually and it was my chance to take it in. To get oriented, I joined a bus tour from Milwaukee with government officials, cultural planners, arts supporters and several artist friends, and we were given a preview. We heard from Jay and Donna who joined us on the bus; six artists creating artwork for this year’s event and the farmers on whose land it appeared; and a special treat, Curt Meine, from the nearby Aldo Leopold Foundation in Baraboo. Meine, who is the conservationist’s biographer, spoke about the Driftless Area and Leopold’s Land Ethic and stayed through lunch. After the bus tour, I remained in the area for three days to participate in an educational session led by Jane Hawley Stevens, founder of Four Elements Herb Farm in North Freedom, about using bitters for digestive health and assimilation of vitamins, and to tour the countryside again, on my own, to make photographs and videos. Southern Wisconsin has seen extreme rainfall for the past several months and it rained or drizzled every day of my four-day visit. The Baraboo River runs through several communities on the tour including Rock Springs where flooding devastated the downtown and it will likely not recover. Farm fields are muddy with crops still standing and beginning to rot. The farmers and the artists have been equally challenged by the frustrating conditions in the fields. Hardship is the backdrop for this Fest that is usually an end-of-growing-season celebration. I annotate my official Fermation Fest Farm/Art DTour map and cross-reference it with the detailed maps in the Wisconsin Atlas & Gazetteer to plot the course of my personal tour. During the bus tour, we only had time to jump out at three spots to experience the art and I am particularly interested in returning to some of them, and getting close-up to several others. North on Highway 136 at the Van Hise Rock geological formation along the Baraboo River is Seeing Double: New Stereographs of Sauk County History, Stand #3: Quartzite Quarries in the Narrows by Sauk City artist Martha Glowacki. The artist researched and collected a series of historic photographs of the county that she turned into stereographs to be viewed at stereoscope stations at four locations. Unlike the grand gesture in Krsko’s work and its enveloping sensorial and auditory experience, Glowacki’s meticulously crafted viewing station asks us to engage in intricate movements – to extract the antique stereo viewer from its enclosure, fine-tune the focus on the photo stereo view card – and then imagine a point in the distant past when the place we are now standing was the scene for very different activities. The stereo views show scarring the landscape for the extraction of its resources (stone quarrying and iron mining); a mono-crop craze (hops in the 1880s) that went bust; and prehistoric effigy mounds excavated by curious Europeans and often leveled for farmland. As the mist turned to drizzle, I drive over hills and around curves through dense forests that capture the luminous yellow leaf light of maples. On County Road PF, I encounter several of the handsome locally carved wooden signs known as Field Notes. They contain 150-word stories to enlighten city folk about rural concerns (land, woods, soil), the different crops and activities in the fields (corn, hay, apples, dairy), and the ethics of Aldo Leopold whose life’s work included experiments reclaiming worn-out farmland along the Wisconsin River in nearby Baraboo. 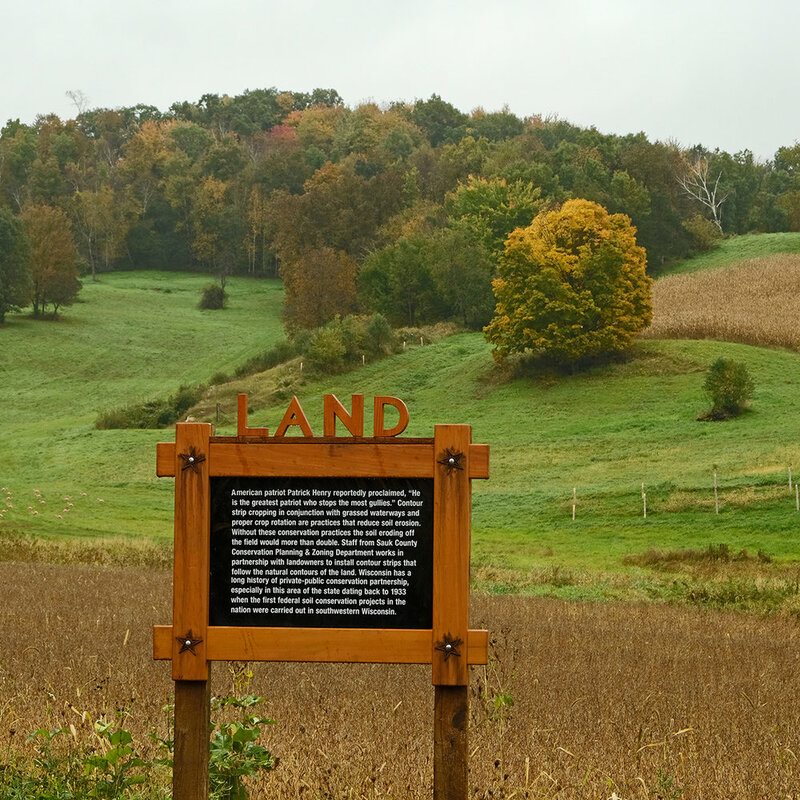 Conservationist Aldo Leopold’s most-quoted moral dictum from his essay “The Land Ethic” in A Sand County Almanac urges us to examine landscape questions in terms of what is ethically and aesthetically right, as well as economically expedient. Leopold says that a thing is right when it preserves the integrity, stability and beauty of the biotic community, and wrong when it tends otherwise. My destination is Birdland, a physically ephemeral work by artist Franck Feurte of LES EOLIENS, a two-person collective with landscape architect Remi Duthoit. Franck traveled over 4,200 miles from Bordeaux, France to create this work in an alfalfa field on Eileen Schutz’s farm. A soft rain is falling as I park my car at the edge of the ditch; but I am prepared for the weather with rain gear, tall rubber boots and a large umbrella. Carefully, I unpack my digital video camera, affix the auxiliary microphone, anchor the assembly to the tripod, and set off up the hill, also balancing an umbrella. The artwork is composed of dozens of thin vertical poles set in the ground with a horizontal cross-piece mounted at the apex that rotates slowly. Feathers from various bird species are tethered to the ends of the horizontal piece; they pivot hypnotically at the slightest breeze. 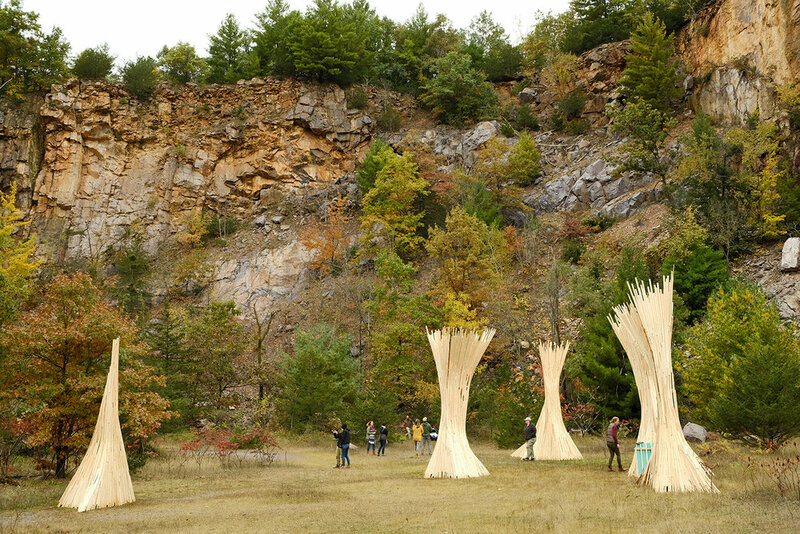 The pole structures are nearly invisible, blending with the landscape, but the movements of the feathers catch the eye and suddenly the piece becomes animated. Feurte set the poles in groupings that proceed up and over the hill and a few clusters are situated at the very edge of the surrounding forest. I head for these remote clusters and produce videos that capture the sound of the soft rain and bird calls from within the dense forest. Unfortunately, the feathers anchored to the pole structures are rather water-logged and barely move. I turn to head back down-hill and behold Birdland playing against the panorama of farm fields, clusters of trees and the forested hills in the foggy distance – an unforgettable vista. I continue to a Food Chain Marketplace at St. Patrick’s Catholic Church at the hilltop crossroads of G and GG. Artist-designed Roadside Culture Stands are selling local meats, fermented products, herbal teas and home-made items. I hope to warm up with some booya produced by the church; a thick stew of fall vegetables and chicken broth said to originate with Belgians who settled near Green Bay. Remarkably, the vivacious lady serving the savory dish introduces herself as Eileen Schultz. She proudly tells me about the history of her farm and the artists, including Franck Feurte, who have produced installations there over the years. My last stop is the McCluskey Brothers Farm Store at Hillpoint that offers on-farm produced maple syrup, and cheese and meat from grass-fed animals. The store is an unassuming single-story concrete block building that was formerly Larry Drea’s Bar for 63 years. The McCluskeys continue the tradition of inviting Irish musicians visiting the area to perform there. I purchase a nice wedge of their Shillelagh Glen Farms meadow cheese. Sadly, this ends my visit. I turn north and head out of the magical Driftless Area. I close the Wisconsin Atlas & Gazetteer and connect with I-94 at Mauston; no need for detailed maps now. During the twilight zone of the four-hour drive back to the Twin Cities, images, sensations and conversations drift through my mind. I think about how making art and farming are similar endeavors; an observation made years ago in conversations with my Dad, a dairy farmer, while explaining why I wanted to go to art school. Art and farming both require accommodating forces outside of one’s control. In the case of farming – the vagaries of weather influence everything from planting to harvesting and the subsequent health and production of the animals that are dependent on the crops. With art, there’s the mysterious alchemy of inspiration, maintaining curiosity to propel yourself forward, and the desire and discipline to make something entirely new and unforeseen that the world may or may not need. Artists and farmers are both affected by the disconnect between how society says that it values our role and products, and the remuneration they are willing to offer. While artists and farmers are committed to the belief that our labor and what we make is worthwhile and of value, our financial livelihoods are often tenuous. Farmers offering their fields as sites for Fermentation Fest art installations and events impress me as open-minded, enterprising and innovative. On their modest-sized farms, they practice rotational grazing, grow organic crops, vegetables, and milk to sell, and many have ambitious on-farm cheese-making or grass-fed beef businesses. They work hard and have a respectful relationship with the land; they collaborate with it. In pre-settlement days, I imagine that single large oak trees, or a large boulder or rock outcrops, or where streams joined rivers, functioned as landmarks. But after Sauk County was subdivided into townships and villages in the 1830s, humans have made all the marks on the land: mining, quarrying, farming, and now, art-making. Artists creating work in this environment, making their marks (however temporary) on the land, also must collaborate with the land. This landscape presents rich aesthetic possibilities for both form and content, and challenges when weather becomes a factor, and offers ways to engage an audience unlike anywhere else. Sensations of the Driftless Area’s undulating landforms, dense forests capturing the luminous yellow light of fall, the patter of rain, drifts of fog in the low areas, the energizing scent of the earth, and the experience of art in this unique landscape – permeate my being – and I don’t want to let them go. This was my first experience of Fermentation Fest and the Farm /ArtDtour, and I vow to return. Fermentation Fest and Farm/ArtDtour continue through October 14, 2018.